Download Exchange Rates for Excel is a practical tool in which you can update automatically through the Internet the currency exchange rates into your Excel spreadsheets. No more manual and tedious updates or risk of using out of date data. 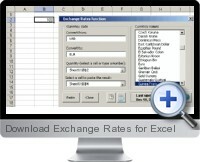 Download Exchange Rates for Excel is like any other Excel function. When the function is inserted in any cell or inside a formula, the add-in automatically refreshes the exchange rates with the latest data. Download Exchange Rates for Excel includes a wizard to help you to use the tool. Additionally it includes different refreshing data options and reports with the exchange rates and currency codes. An Arithmetic Calculator with GET and PASTE functions: You can copy the content of the selected cell and paste the result to the destination cell. A Save Report function: you can save your daily reports in your desired folder. A set of tips which will give an advice every time. An uninstaller. Note: The exchange rate data is obtained from the MSN Money Central Investor web site (http://moneycentral.msn.com/investor/home.asp). The quotes are delayed by at least 20 minutes.